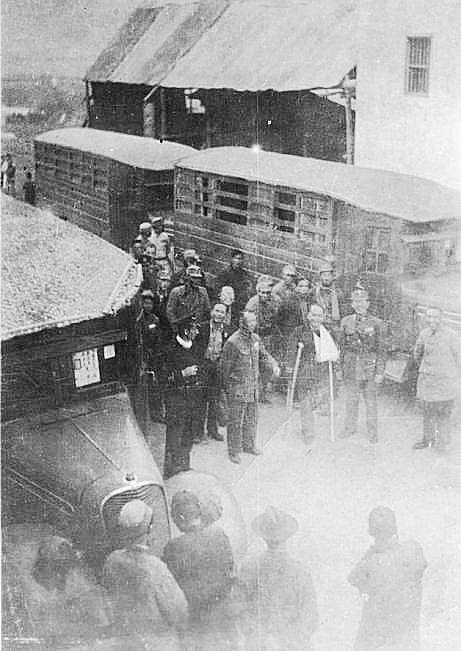 Left: Admiral Chan Chak with Yeung Chuen behind him & Hsu Heng, wearing his dark coat, by the truck with Sub-Lt D.P. Legge to the left looking on during a stop at Lianping, about 1/3rd of the way from Longchuan to Kukong, now Shaoguan. Lianping had grown from a typical fortified walled village into a small town where the ratings were billeted in the Middle School for the night with the officers in a hotel. Top Left: Petty Officer Charlie Moore of MTB 27 looking pretty whacked. Top Right: Bones Arnold and Buddy Hide with his hand on guerilla leader Leung Wingyuen's shoulder. Lofty Gurd of MTB 09 is on the left hanging out of the back of the ambulance in the top right picture along with Bill Schillemore, & John Pawley. The padded jackets were obtained by the British Liaison officer to the Chinese army Lt- Colonel Harry Owen-Hughes, at Lung Chun. The party later swapped their Chinese army jackets for khaki shirts & shorts with an incoming detachment of British/Australian Marines of the 204 military Mission at Kunming. Bottom Left: Admiral Chan Chak ROC and the senior Royal Navy Officer Cmdr Hugh Montague RN being feted by Chinese Army Officers Kukong. Note the HERO rosettes visible on some escapees lapels in the two top pictures. This page is from "The War Illustrated" Vol 5 No 126 April 17 1942. These photos were also featured in "The Illustrated London News" 21st March 1942. PO Prest: "We traveled by cycles, lorries, junks, and donkeys, but mostly we walked. It was a case of march or die"
Given to each member of the escape party at KuKong while escaping through Japanese occupied China. This is a direct translation given to me by Admiral Chan Chak's son Donald.